It’s a good feeling when your friends know just what you like. They surprised me for my birthday last week with two new books, not bestsellers or popular fiction, rather a devotional and a collection of letters by C. S. Lewis. I don’t know many other young adults who have the same taste in birthday presents, but my friends could tell those were just the presents to make me smile. The way I see it, if I love reading (which I do) and I believe this life is followed by an eternal future (which I also do), what better material for me to read than what concerns life here on earth while keeping in mind eternity after death? This life is a blink compared to eternity, so I want to make the most of it by learning all I can about what is to come and how to get ready. Besides, if Christian faith and its theology describe the one god of the universe, the almighty creator of everything that exists, and the preserver who keeps our world spinning, there is no bigger subject for me to devote my time studying. You can’t read about anything bigger than the being who fills all of creation with his presence. So, my friends knew any Christian-related book would probably excite me. 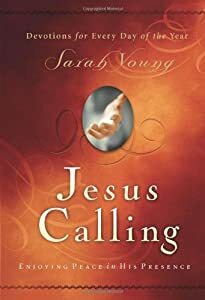 The first book I received was Jesus Calling by Sarah Young. This devotional has short letters for each day of the year, written as if addressed to you from Jesus. I can read each day’s in a minute or two while drinking my morning tea. According to the description on Thomas Nelson’s page, Young had the idea for the book from deciding to write whatever she felt God say to her. But she isn’t imagining up the words out of nothing. She’s not like one of those “crazies” you heard about on the news who said God told them to burn down their house. Young is a long-time missionary to communities in Japan and Australia. In a “Q & A” interview on CBN.com, Young explained how she kept a prayer journal for several years and eventually felt inspired by the book God Calling in which two anonymous women listened for God’s voice and wrote what they heard. While Jesus Calling is not Scripture, as Young warned, the daily messages still come with a curiously divine intimacy. The words give me the feeling that Jesus is sitting just next to me, speaking close by in a calm and soothing rhythm. But I don’t have to rely on what he says through Young, because each message comes with verses to look up and read for myself God’s words. I end my reading day in bed with my next book, C. S. Lewis: Letters to Children. I’m already 90 pages into this collection and the book has just over 100 pages if you don’t count the bibliography. The reading has been so entertaining, though, that there’s a good chance I’ll be re-reading this one before long. The collection presents a sample of the thousands of letters C. S. Lewis wrote to children, who the majority of which had questions about their beloved fiction series, The Chronicles of Narnia. I’ve always appreciated C. S. Lewis the most for his deeply theological writings, serious stuff like Mere Christianity, Miracles, or most recently The Four Loves. I saw him as an analytically minded academic who explored without fear the harder questions that face Christian faith. Letters revealed a new depth to his character I had not known. It turns out Lewis considered himself still much of a boy even after 50 years old. He answered every letter he received, including those of young fans and his god-daughter, despite the stacks of mail often would demand a significant part of every morning to read and write responses. He wrote to the various children with affection and concern, while addressing them with the respect due to grown-ups. It amazes me that he would exchange several letters with children living across the pond in New York or Florida and take notice of details about their families, classes, and interests. This reminds me of when Jesus beckoned children to him (Matt. 19:14; Mark 10:14; Luke 18:16). Lewis followed Jesus’ example to stop and take time for curious young children. He didn’t just write about faith and theorize about what it means to be a Christian. Lewis lived in the footsteps of Christ.